All AMTs are encouraged to attend. 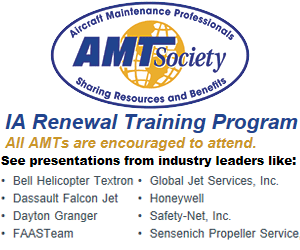 Each seminar in AMTSocietys IA Renewal Consortium meets the requirements contained in FAR 65.93(a)(4) for Inspection Authorization (IA) renewal training and is acceptable towards 8 hours of training for IA renewal and the FAA AMT Awards Program. In addition to AMTSocietys IA renewal training, YOU MUST also comply with the “actively engaged” requirements in FAR 65.91(c)(1)-(4) to meet the requirements of IA renewal. Cost is $21 to current AMTSociety Members who register in advance at least one week prior to the event. On-site registration will be $49.00. Non-Members who register before the event will be charged $70, which includes a one year membership to the AMTSociety. Non-Members registering on-site will be charged $98 (includes the membership). Registration online will be closed one week prior to the event. If you need help registering after that time please contact the AMTSociety at 800-547-7377 x 1717. Refunds will not be given unless we are notified 7 days prior to the event being held. The "Register" link will change to "Attending" and you will receive a confirmation email. Special hotel offers have been arranged at selected venues for these events. Special Rates for IA Renewal Attendees at the Holiday Inn & Suites - Call 1-888-465-4329. Special Rates for IA Renewal Attendees at the Holiday Inn KCI Airport and KCI Expo Center Call 1-800-957-4654.